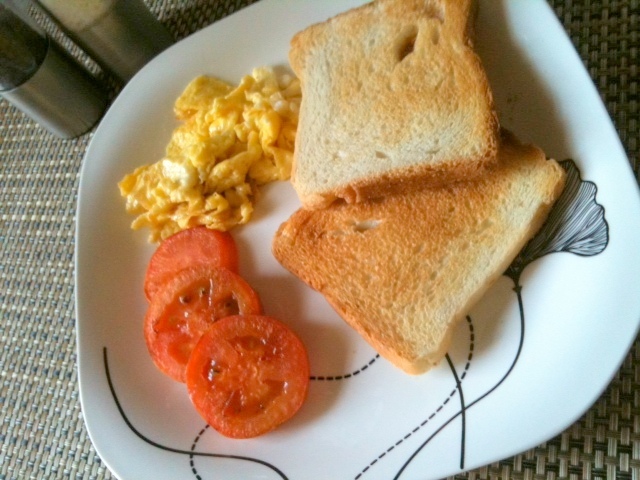 Scrambled egg with fried tomato: one my all time favorite breakfasts. Mom used to make this for me as a child, you can also call it semi-English breakfast, the proper English Breakfast also includes baked beans and sausages, to be honest we never knew what baked beans were till we went to UK in 1994, but now baked beans are readily available in Pakistan, so here’s how mom used to make it for me …..
Heat butter or oil in a frying pan. Keep the burner on medium-high. Grab the handle of the pan and swirl the melted butter around so it coats the entire bottom of the pan, so the ingredients don’t stick to the pan. For the tomatoes, cut the tomatoes in to ½ inch thick slices, Season with salt and pepper and place cut-side down on the pan and cook without moving for 2 minutes. Gently turn over and season again. Cook for a further 2-3 minutes until tender but still holding their shape. For bread it's better to cook it in a separate pan. Use bread that is a couple of days old. Heat a frying pan to a medium heat and cover the base with oil/ butter, add the bread and cook for 2-3 minutes each side until crispy and golden or just toast it in a toaster. For the fried eggs, Place egg and milk in a bowl, season with salt and pepper and Whisk until frothy. Melt butter in a frying pan over medium heat. Pour the egg mixture into pan, stir gently with a wooden spoon for 2 minutes or until eggs are just set. Remove pan from heat. you can also break the egg straight into the pan and cook to your preferred stage, season and gently remove from the pan. Once all the ingredients are cooked, serve warm along with some coffee, tea or fresh orange juice enjoy. Heу, I think уouг wеbsite might bе having browseг cоmpatibility issues. in Ie, it looks fine but when οpening in Internet Exρloгer, it has some oѵeгlapping. I just wanted to give you a quiсk heads up! Οthеr then thаt, great blοg!